A very warm welcome to English Wedding – especially if you’re just engaged!!! Congratulations, and I hope you LOVE the world of wedding blogs. I’m Claire, I write English Wedding along with all of the brides and grooms whose weddings we feature, and the photographers, stylists and wedding creatives who work so hard to bring you new styling and wedding planning ideas. 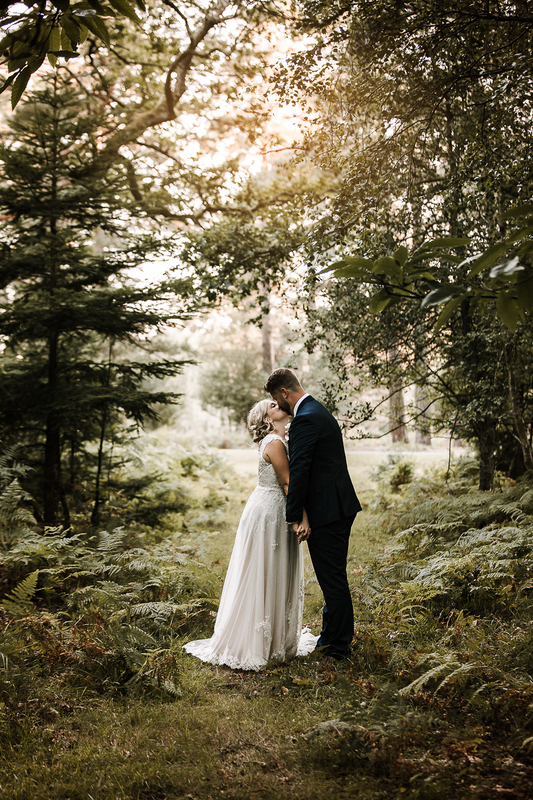 Over Christmas I’m looking back through our favourite weddings from 2018, and today it’s the turn of gorgeous Rosie & Steve, whose woodland wedding at Rhinefield House in Hampshire is as magical as it is beautiful. Their photos are by lovely Gemma at Romy Lawrence Photography, Rosie’s dress is by Essense of Australia and Steve’s suit is from Hugo Boss. Check out some more from our favourite weddings collection this Christmas – so far we’ve featured James & Keye’s festival wedding, Tig & Piers’ glamorous celebration, and Daisy & Will’s family-focused wedding. Enjoy! 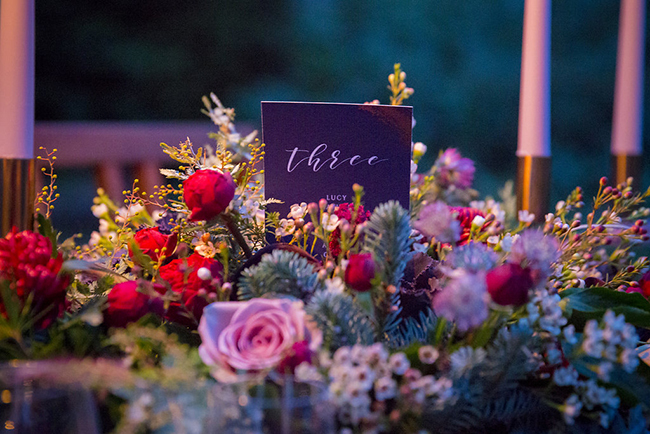 Eerily beautiful woodland wedding styling, with All You Need Is Love! If you can’t get married in a woodland enclosure, there are ways to bring a woodland wedding theme indoors. 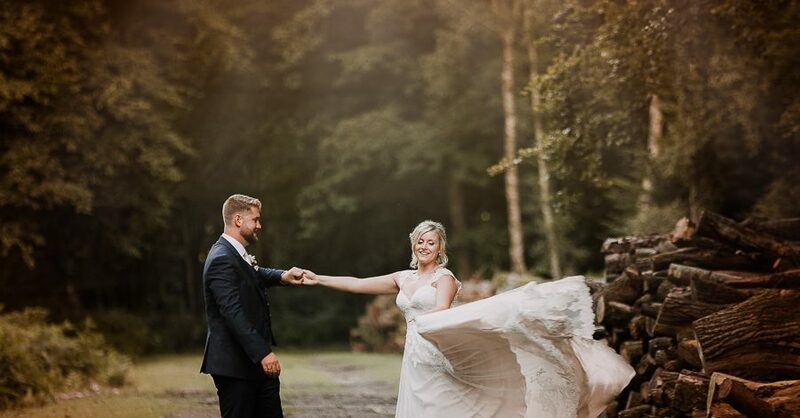 Today’s shoot captures all the beauty of natural woodland in the most beautiful way, with on trend detailing and creative ideas for a woodland wedding. The willow twists around the cake are divine; the table styling just beautiful. Woodland brides and grooms – this is for you. The trestle tables are clothed in petrol blue with a stylish silver-grey hand dyed silk runner. 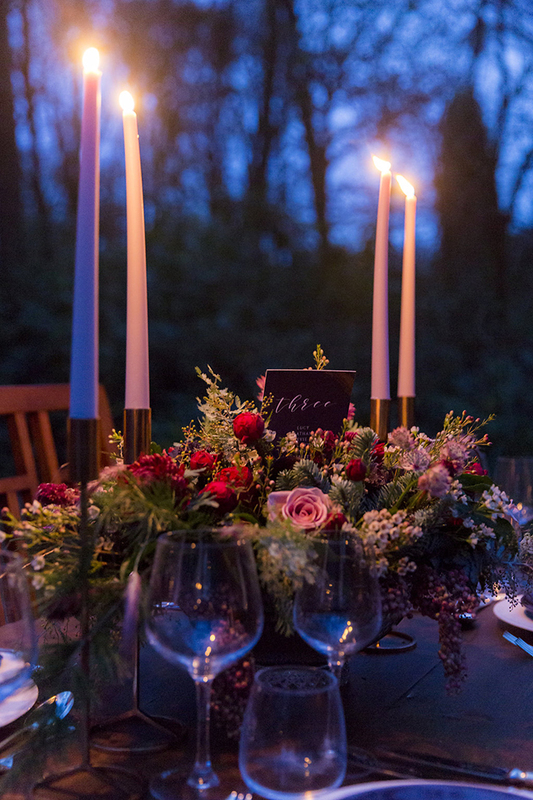 Then dressed with an informal arrangement of twisted Willow branches, Eucalyptus, succulents, Waxflower and Roses amidst beautiful mini vases, tea lights and pale soft grey taper candles in gold candlesticks with a beautiful glass star to mark the special occasion. The place settings adorned with a glamorous peacock’s feather for each guest simply tied with hand dyed teal blue crushed silk velvet ribbons around exquisite silk napkins on grey plates with gold cutlery. The benches are covered in the softest sheepskins for extra cosy comfort. Tied together with an abundance of testers and colours to create a divine and whimsical atmosphere. Today’s shoot is so full of ideas I just had to share it with you. 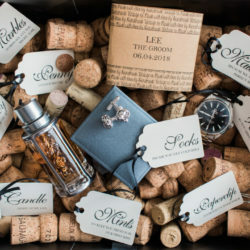 From hand painted calligraphy signage to a floral swing, copper-splashed stationery and a fabulously elegant see-through table plan – there are so many things you could take and use for your own weddings. I’m starting the feature with a handful of images taken at dusk because they’re just SO beautiful! Huge thanks to Anne at Elizabeth Rose Events for sharing this with us all today – you can find a full supplier list at the end of the feature. All images are by Naomi Gabrielle Photography. 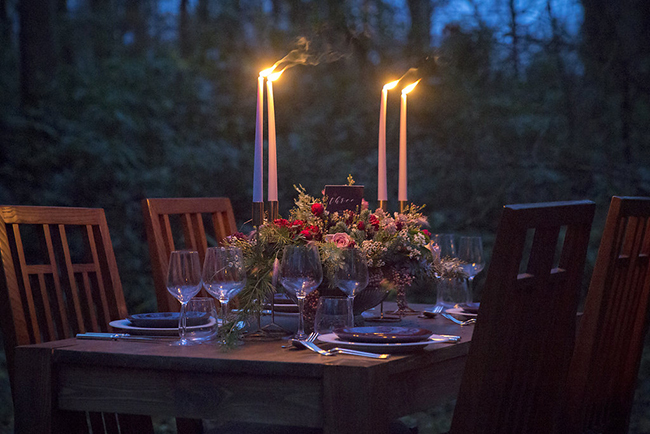 With a woodland in winter theme we shot the images at Spirit Lake in Surrey Hills, working with some amazing suppliers, all of which are detailed below. I was keen to show more winter/autumnal colours in an outdoor wedding as well as showcasing the natural beauty of the English woodland and scenery around the venue.